DEAR PRINGLES, NOW THAT I AM NO LONGER A CHILD, I CANNOT FIT - ProudMummy.com the Web's Community for Mums. 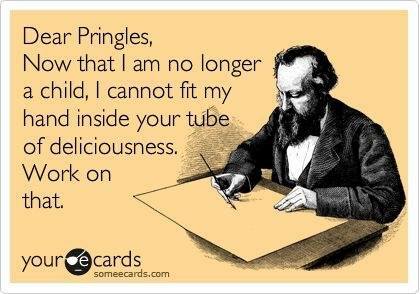 DEAR PRINGLES, NOW THAT I AM NO LONGER A CHILD, I CANNOT FIT MY HAND INSIDE YOUR TUBE OF DELICIOUSNESS. WORK ON THAT.